Thor: Son of Asgard was originally supposed to run for only six issues. But, supposedly due to reader demand, it was extended for another six issues collected here as Thor, Son of Asgard vol. 2: Worthy. The first chapter, Thor Son of Asgard #7 starts the first story arc, ’Enchanted’. 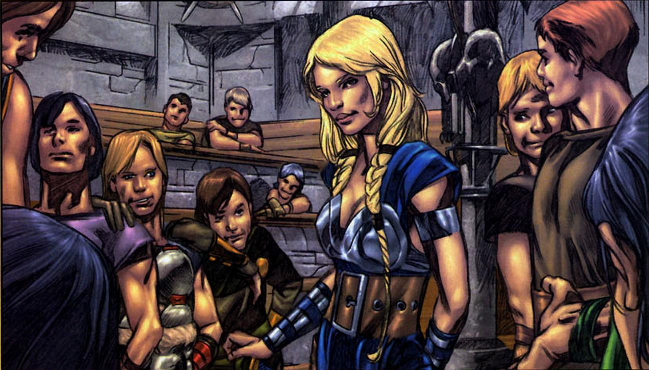 With Karnilla’s attack on Asgard repulsed, Thor, Balder and Sif return to their training. This issue is mostly about the growing relationship between Thor and Sif. I don’t believe Balder even has a single line. But Loki is back to his old tricks too, and now he has a new ally in Amora, the Enchantress. Both want to break up Thor and Sif for their own reasons. Story-wise, this series seems back on track. In fact, this may be the most well-written issue so far. 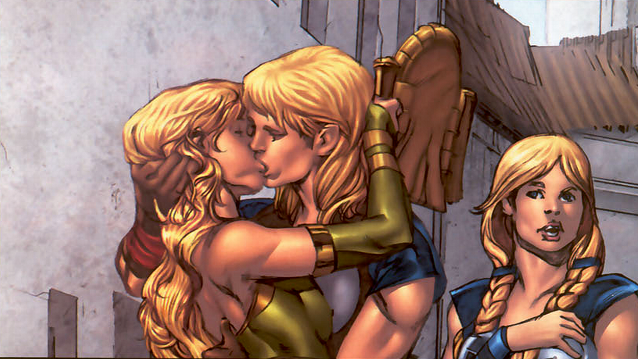 The angst Sif feels at being the tomboy of Asgard is a lot more believable than the teen posturing of past issues. But no sooner does the story get back on track than the art seems to take a big step backward. The first, relatively minor issue I have is that the teen swordfighters are shown fighting each other in practice swordfights with no armor, and real swords. The way they go at it the sword-fighting school of Asgard must loose a couple students to decapitation and other mortal wounds every day! But really, that’s a minor quibble. A bit more of a pet-peeve for me is that, up until now, I’ve been keeping my mouth shut about Sif being portrayed as a black haired girl. Anyone who knows their Norse mythology knows that the one defining characteristic of Sif is her golden hair! It’s as iconic to the character as Thor’s hammer or Odin’s eyepatch. Anyway, the reason I bring it up is because this issue Sif actually makes a big deal about both The Enchantress and Brunnhilda being blonde – which just points up this inconsistency. Well… so far in this series Thor has no hammer, and Odin no eye-patch, so perhaps a mystic bleach job is in Sif’s future. The good news when it comes to the art is Jo Chen’s awesome cover. The bad news when it comes to the art is that nothing inside the issue even comes close to it in quality. In this chapter, there’s an even bigger reliance on the colorist for shading than ever – there’s almost no added dimension from inking here. With this issue, the colorist does all the shadows – and they seem to be overdone. 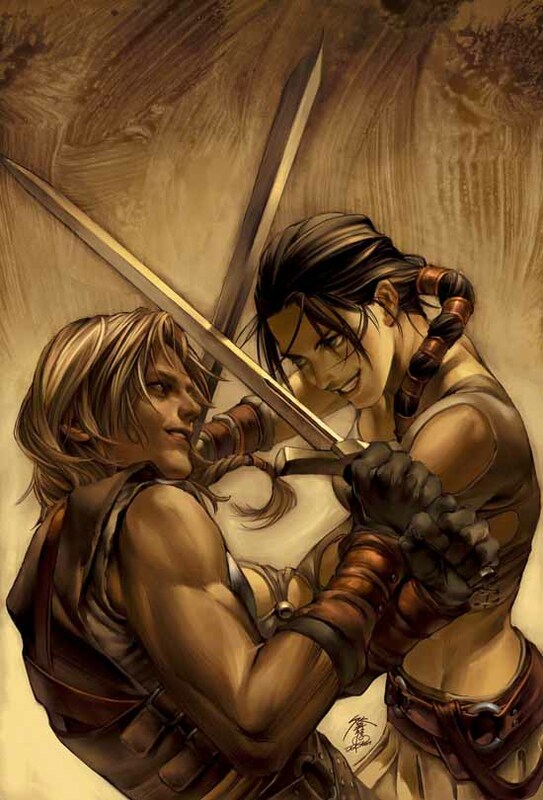 The characters’ faces look ape-like, gaunt, or otherwise distorted in nearly every panel due to the high contrast coloring; and overall, the scenes look muddy and dark. I hope in future issues the coloring will be able to pull off this added job, or that the creators realize how bad this looks and go back to good old fashioned inking. The second issue of ’Enchanted’ is called ‘The Trio Triumphant’ – does the title sound familiar? It ought to, it was the same title as issue before last (final chapter of the first TSOA TPB). What it has to do with this story I’m not sure – I think they just copy-pasted the title page from two issues ago to use as a template, and forgot to change the title! This should be titled ’Enchanted part 2’, but like I’ve said in the past – attention to detail doesn’t seem to be a priority with this series. The continued lack of editorial control notwithstanding, this is a significantly improved issue. For one, the golden hair of Sif issue is finally addressed – either I should have had more faith in the writing, or else they realized the need to tackle it after last issue – anyway, my guesses about mystical dye jobs weren’t so far off base. The colorist handling shading details seems to be improving too – while it still seems heavy-handed and weird looking to me, there seems to be a little more restraint in this one, less dark muddy looking panels, and the faces are a little better. The team of Loki and The Enchantress seems to be perfect for what amounts to a high school teen drama set in Asgard. Though, one wonders why the heroes still bother listening to a word Loki says – how long will it take them to learn that lesson? Anachronisms du jour: The Enchantress talking to Sif about her complexion might not be a true anachronism, but it sounds a little too Cosmo to us. With the final chapter of the ’Enchanted’ storyline (issue #9), the series is on the upturn. The story of Loki and Amora’s plan to enchant Thor actually reads like something from Norse legend for the first time. And, while the inkless art style still causes some problems when it comes to shading, whoever or whatever ‘Guru eFX’ is, it’s improving. Valkyrie does reach out to Sif despite the fact that last issue they were at each others throats – but then I guess they’re supposed to be heroines, so changing on a dime is O.K. if it is changing for the better. Probably the largest criticism about the series at this point is that it seems to be more like Sif, Daughter of Asgard than about Thor, but that’s O.K., I guess. It’s hard not to like Sif, even when she’s acting like a brat. Sure this whole thing is a little like ”Asgard 90210”, but frankly it still works because so many of us are willing to buy into the old tropes of ‘the pretty ugly girl’ and how even though she’s a tomboy, she wants to be a princess on prom night. It took 10 issues, but it finally feels like the excitement has really started in Thor, Son of Asgard. In this chapter (part 1 of the 3-part story arc called ’Worthy’), Thor finally lifts Mjolnir for the first time. This prompts him to travel into the wilds to seek out the fates and learn more of his destiny. But, in his absence, Asgard is again attacked – this time by storm giants – who lay waste to the city and kidnap Sif. Odin orders Thor to stand guard over Asgard, but Thor has different ideas. There’s a few things to praise about this chapter. For one, the action really gets started – and if there’s one thing Thor comics were created for, it’s for ”King” Kirby style action. Secondly, this issue has some very dynamic angles – as you can see by Jo Chen’s fabulous cover; Greg Tocchini’s interior art maintains that same cinematic quality throughout. Finally, for once the story feels like Norse mythology. There are none of the obvious anachronisms that plagued past issues – and Thor and Odin even talk a little like we expect them to. If I have any complaints, it’s that the balance between pencils and inks still seems to be a bit… off. But it’s certainly getting better. In issue #11, Mjolnir in hand, Thor sets out for Jotunheim to rescue Sif from the Storm Giants. This issue is fast paced, and again feels like a mythological story – which makes it better than a lot of the TSOAs before it. There are still a number of things that concern me (probably more than the average comic reader). For one, the unfinished pencils look just that – unfinished. I not only find this displeasing to the eye, it can at times make things look confusing. For example, the largest battle in this issue involves Thor fighting some storm giants – I’m sure the way this was originally scripted, it involved a blow-by-blow narrative. Unfortunately, this battle, which goes on for several pages, looks more like a montage of images than a true fight sequence. Another concern I have is how the issue sort of glosses over things – for example, Odin and the other Asgardian gods went to Jotunheim already – but, at no time does Thor overtake them on the journey, and they are nowhere to be seen when he arrives. In another case, Thor sort of risks everything on a silly attempt to fly using his hammer (which of course works, because we the readers already know that’s how he flies) when he has no knowledge that such a thing is possible. A third example would be when Thor is required to go to the highest peak in Jotunheim and call upon Hel – a quest which for all it’s seeming epic-ness, lasts only a couple panels. All this nit-picking may make it sound like I dislike the issue – which isn’t the case at all. I think this is one of the better issues in the series so far; dispensing with the moralizing and the anachronisms in favor of a more mythic feel. Also, Jo Chen again turns in another awesome cover. I think this series is heading in the right direction, it’s just not there yet. In the third and final chapter of the ‘Worthy’ story arc, Thor faces Hel, goddess of death, who has taken his love, Sif. There’s not much I can say about this climactic chapter, and still remain spoiler free, but I will say that the young Thor is clearly outmatched by the ancient and powerful goddess. How will he defeat her? Chances are you can probably guess the ending, but even if you can, it’s still not too bad. Overall, this chapter reads like an early issue of Journey into Mystery, and so it’s perhaps not too surprising that the credits page of this issue thanks Stan Lee and Jack Kirby. And that brings to a close the entire Thor: Son of Asgard series. Having served its purpose, it can now be developed into a kids animated cartoon to act as a cross-promotional tie-in to the upcoming Thor feature film. While it may have been nothing more than a ‘paycheck’ series to them, at least the creators had the integrity to try to develop an in-depth origin story for the Thor dramatis personae, and for that they deserve a tip of the great helm. A quick, fairly mindless action-oriented origin series for Thor that’s fun, but by no means essential. 3 out of 5. This series is not essential to understanding the modern Thor character. It was probably created to be the blueprint for an animated DVD called ’Tales of Asgard’ and to tie-in to the big screen ’Thor’ movie, so it does introduce many of the most important characters in the Thor series, which would make it (along with Vol. 1) a good primer for anyone who has never read Thor and wanted to get up to speed fast. 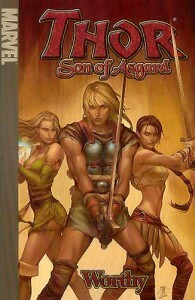 Prior to reading this, it’s recommended that you read Thor Son of Asgard Vol. 1: The Warriors, since although this can stand alone, it picks up immediately following the issues of that volume. You might want to follow up this trade paperback with a viewing of the original animated DVD Tales of Asgard, starring Jay Brazeau as a teenage Thor, which is said to have been largely based on this series. Thanks for posting this Gorby. I wrote it a while back – being the obsessive I am, I’m reading the Marvel Trades in the TRO database order and this series was first. Currently I’m almost done with all the Thor stuff at the beginning,(first 10 trades on the Marvel Universe reading order) and I have to say that Thor: Son of Asgard was my least favorite of them. You didn’t include a number in your review, so I had to improvise the 3. If you’d like me to change that score, let me know.